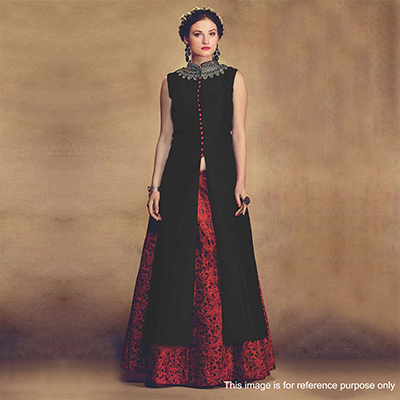 Get a perfect party wear look with this black - red lehenga style suit. Featuring tapetta front slit top enriched with embroidered work high neck and Italian bangalori silk lehenga beautified with attractive digital print work in contrast color. The outfit top and lehenga comes as semi stitched. It's a perfect outfit to wear for parties & functions. Length Chest upto 38 - 40 inches and length upto 42 - 44 inches. Length waist upto 38 - 40 inches and length upto 40 - 42 inches.